I’m in love with timers. Not old-timers (as in old men), but timers with buttons & sounds. I love them! I own no less than 5 timers and that doesn’t even count the timer on my cell phone, the microwave or the stove! One of my timers even has the capacity to set 2 different times simultaneously. How cool is that?! I use them all on a daily basis, too. Why on earth would anyone do that? Oh, let me enlighten you to the wonderful world of timers…they’re not just for baking, my friends! The 1st timer (hourglass) was invented sometime during the 14th century in medieval Europe. They were used at sea, in cooking & industry because they were the first reliable & accurate measure of time. I firmly believe I developed a love of timers from my Grandma, without even knowing it. She’s used timers for as long as I’ve been alive (and I’m nearing 40 – aaagh) and probably started using them long before I was even born. She uses them for everything & almost runs her life by them. 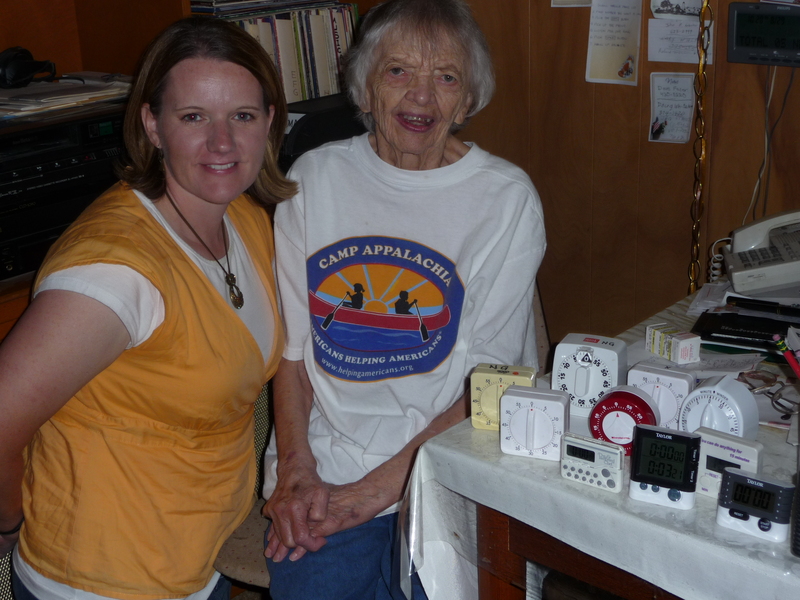 She’s 90 & still uses her timers. I thought it would be fun to take a picture of our different timers. Isn’t she cute? My Grandma’s timers are all the turn-dial ones & mine are all digital. Timers have changed, but the need for timers hasn’t. So why are timers so essential to organizing? There’s many reasons. The main one is that they keep you focused on the task at hand & help you not feel overwhelmed. That’s probably the #1 reason people DON’T organize. They’re just too overwhelmed. With a timer, you can break the project down into smaller increments, not feel overwhelmed & still get something accomplished. Timers will set you free, like a caged animal! Doesn’t that sound exciting? I know you’re sceptical. My kids are still sceptical, as are many of my friends. You’ve just got to trust me! Timers will save your sanity. And don’t we all want that? In future posts I’ll talk about what to do with timers to make the task at hand that much more enjoyable. Soon you’ll be in love as well. This entry was posted in Uncategorized and tagged organize, tasks, timer. Bookmark the permalink. Thanks for inviting us to your blog. I enjoyed this post and the picture. This is so funny–I always thought your grandma was OCD! Now I know you are, too. Just kidding!! I have already read through all of your posts and am very interested to try this timer thing. Because, you know, I have a problem that really bugs me, and that is that I am not very organized and I HATE organizing. Maybe this is the answer to my problem! Then I will become like you and your grandma and my problem will be timer obsession. But maybe that’s better than chaos. Seriously, this timer idea is fascinating and revolutionary to me. You are going to LOVE timers…eventually! It does take some getting used to, but then you’ll wonder how you ever got along without them.